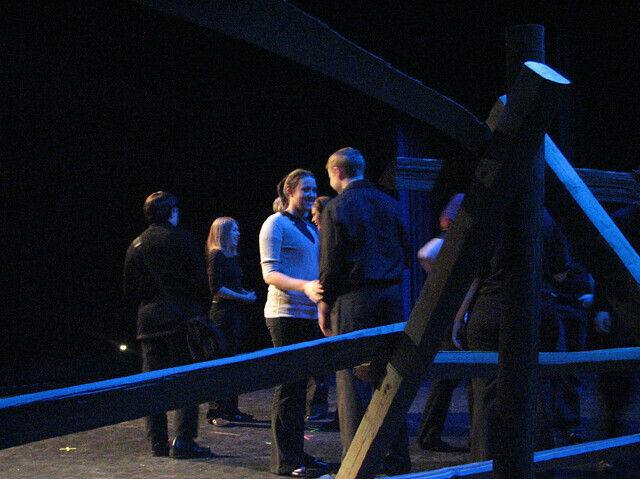 The Laramie Project is the result; it is a noteworthy example of an emergent genre of drama that has gained popularity in Europe and the U.S.A. since the 1960’s, a form of playwrighting (in its traditional sense of playmaking) now often known as “Theater of Testimony,” in which plays are created out of “found texts” such as news reports, government documents, trial transcripts, interviews, and memoirs. Theater of Testimony pieces are invariably topical, usually controversial, and possess an immediacy of impact on audiences who, aware that what they’re hearing is “the real thing,” are often disturbed and moved by the removal of the pleasant protective notion that a play is a work of fiction. The genre has produced works as diverse as German dramatist Pete Weiss’ The Investigation about the trial of some of the Nazis who ran Auschwitz, to American playwright Emily Mann’s Execution of Justice about the notorious assassination of gay activist city councilman Harvey Milk and Mayor Moscone of San Francisco at the hands of a conservative former councilman. This genre’s tradition for having a capability to confront audiences with hard questions is carried forward admirably by The Laramie Project. This excursion into the world of Theater of Testimony has forced the members of our theater company to learn some new acting techniques; among these are the problems of playing monologues directly through the “4th wall” of the theater and right at the audience, not so much interacting with their fellows onstage as pulling off the difficult feat of each having to lightly characterize multiple individual speakers with select bits of clothing, props, and “quotable gestures” while simultaneously keeping some emotional distance from the characters they portray and commenting on their relationships and motivations. The use of minimal scenery and onstage costume changes also remind the audience that while the words are authentic, the experience remains heightened and theatrical. These techniques, popularized in the politicized theaters of Russia, Germany and the U.S.A. during the European political upheavals of 1920’s and 30’s and the Great Depression, reveal the political and social-criticism pedigree of the Theater of Testimony genre.